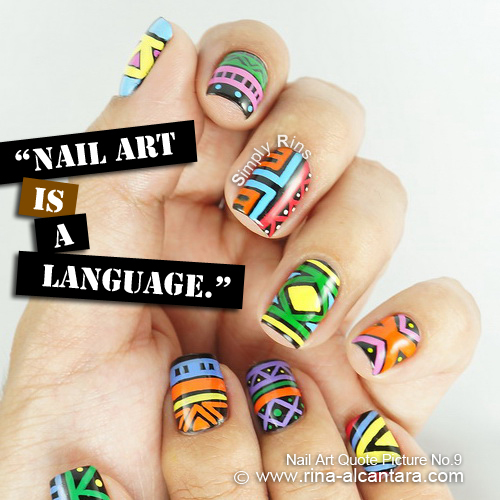 "Nail art is a language." Perhaps this is another way of saying that nail art is a form of self-expression, whether it's a DIY or someone else did it for you. We choose how we wear our nails. And for some, nails have become a channel to convey thoughts or feelings that we simply can't say with words. You might find this hilarious, but recently, I've been using nail art as a post-it to remind myself of things. So when I am feeling lonely, I make sure I paint my nails with a design that will tell me to cheer up. Are you guilty of something like this, too? Yes, nails can't literally speak. But it can communicate through its language -- nail art. Nail art used in photo is Tribal. So intricate! I love this. You do such a lovely job on your nails - the time and dedication it takes to make little masterpieces like this, wow. Good job! Your manicures are such a source of inspiration for me. Well if nails are a language I must be spouting some serious crap all the time. Actually, that's probably about right.